Description: The text: Suomen Luisteluliitto r.y. ON SAANUT XV OLYMPIAKISOJEN MUISTOMITALIN ANSIOKKAASTA TOIMINNASTA KISOJEN HYVÄKSI. XV OLYMPIA HELSINKI 1952. Signed by Erik von Frenckell and A.E. Martola. 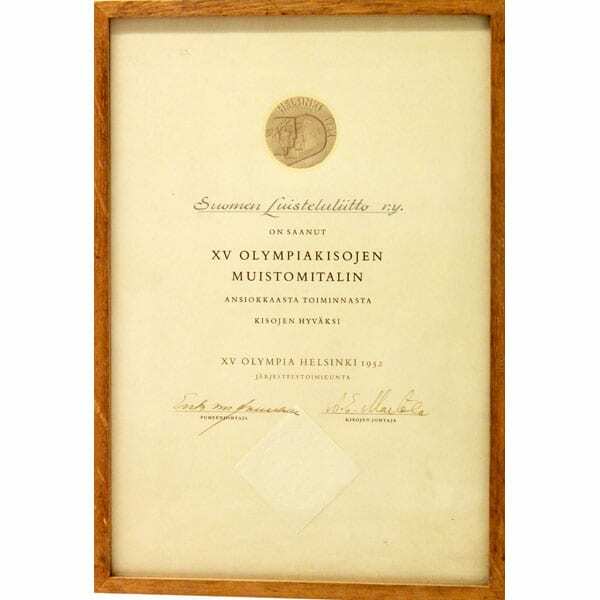 Other information: Deed of commemorative medal awarded to the Finnish Skating Association.